Winter and holiday season is here which obviously means Christmas is just around the corner. Selecting good Christmas gifts for your loved ones is not an easy task, but one thing that everyone likes are Smartphones, so giving Smartphones as gifts is not at all a bad idea. Well, it doesn’t matter if you wish to get a Smartphone for yourself or for your loved ones, in order to help you out get one of the best we are covering Best Smartphones of this season. So check out our list of 5 Best Smartphones to Get for Christmas 2011. A little description about the features etc of each is also given, to help you pick the one that suits your needs te best. Check them out! Well, wasn’t this obvious?! Yes, iPhone 4S is obviously on our list. It is not only one of the most popular smartphone but also one of the best. iPhone 4S boasts iOS 5 which has a lot of great features. Siri is one of the most popular and talked about feature on this latest iPhone and it is for a good reason as it is totally mind blowing — the best features of iPhone 4S. Its camera is also great and you can capture amazing phones and videos using it, even in low light. It also has got a Dual-core processor of the iPad 2 which makes everything quite smooth and quick. Other advantages include: the presence of many apps in the App Store, iCloud, iMessage and PhotoStreaming etc. Samsung Galaxy Nexus is the third iteration of the Google phones. It comes with Android 4.0 (Ice Cream Sandwich), which is extremely smooth, clean and user-friendly like iOS. It boasts 4.65 Super AMOLED display. If you are a fan of big displays, then this is the phone you should get. Another great feature is that it is a Pentaband phone, which means it supports 5 frequency bands including the 21 Mbps HSPA+ data network. The phone looks really pretty. But the bad news for people in US is that it is still not available there, but will soon be released on Verizon as a 4G LTE phone. Samsung Galaxy S II and S II Skyrocket are two great Android phones. f you don’t mind AT&T, then you can get the Skyrocket. It boasts a display of 4.5 inch and a 1.5 Ghz dual-core processor. Awesome Super AMOLED Plus display is present, which has super good and bright colors that most phones don’t have. If you are looking at the price, it is a better option than Nexus. Eventually you would be able to upgrade it to Ice Cream Sandwich, which means you would have a great phone for a lot less money. 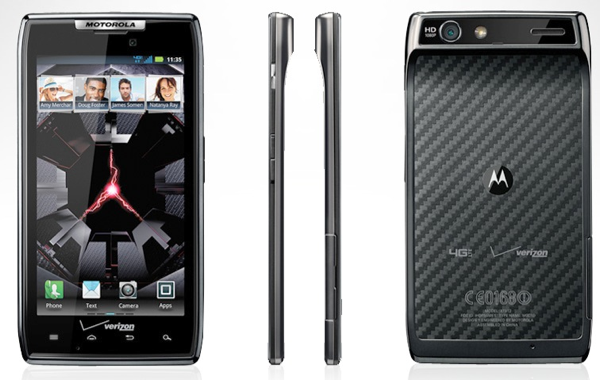 Motorola Droid Razr would definitely be one of the best Android devices for the holiday season. It outshines every other phone out there when it comes to specs and features. It is a 4G LTE phone. It is has Ginerbread, but you would be able to upgrade it to Ice Cream Sandwich. Its camera is 8 megapixel which is totally cool. It has HD video support, HDMI-out, LED flash and DLNA support. It has a 4.3 inch Super AMOLED display. It also has a Kevlar fiber scratch-resistant back and Corning Gorilla glass on the front, and these two things make it quite strong. It is also one of the thinnest (only 7.1 millimeters thick) mobile phones out there. Awesome phone on the whole, right? It is yet another great phone. It comes with Anrdoid 2.3.4 Ginerbread, which is very good, but definitely not as good as Ice Cream Sandwich. But you would be able to upgrade it eventually. HTC Vivid is the second phone that was released on AT&T and it supports their 4G networks. It boasts support for both the LTE next-gen network and the present 4G HSPA+ network. But when it comes to specs, it is a little lower than the Galaxy S II. It has a 1.2 Ghz dual-core processor, 1GB of RAM, 16BG of internal storage, and a microSDHC slot. Camera is 8-megapixel and has a dual-LED flash. It can capture 1080p HD videos. It also has a HDMI-out port plus integrated DLNA support. This DLNA support enables you to stream videos and photos from your phone to a DLNA certified device such as an xBox, Playstation, Blu-ray player, etc. nokia lumia is the most crap. All these phones are crap. What I want is Nokia Lumia 800. Since not available this yeat, perhaps I’ve to wait next Christmas.